The European payments market continues to demonstrate impressive growth. Globally M&A in payments is strong. In Q4 2018, payments registered the fastest quarter-on-quarter growth in M&A deals in the financial services sector (30.8%), despite only accounting for 11% of the total M&A deal count according to GlobalData Payments. Meanwhile in Europe, there have been many notable multibillion-dollar landmark deals over 2018 and early 2019 that have set the bar high for the coming 12 months. As customer expectations around digital experience and instant global payments have soared, financial services incumbents are struggling to effectively leverage technology both to innovate and to protect their customers’ data. Financial institutions are often held back by regulation, traditional transaction chains, legacy systems and limited access to technology talent. Fintechs, who are more nimble, do not face these challenges and are therefore able to stay ahead of the curve and compete more effectively than incumbents by enabling fast, transparent and secure cross-border payment processes. In addition, the European Parliament’s PSD2 open banking regulation, which came into effect in January 2018, has certainly had a key impact in enabling payments innovation in Europe. By enabling payment initiation and account information services, the Directive has facilitated growth for fintechs and increased the urgency for digital transformation amongst traditional banks. With no clear leader emerging yet in Europe, the combination of increased competition for customers and an ambition for scale has led to a surge in consolidation in the European payments market – both between incumbents and fintechs and between fintechs themselves. Within Europe, Danish payments platform Nets moved to acquire Polish online payment fintech Dotpay/eCard, building up its presence in Europe across borders by gaining access to the Polish market. Smaller payment fintechs were more concerned with national dominance, given the saturation of the market, consolidating to achieve a better position: Payconiq and Bancontact merged in May 2018 to form one mobile payments provider to take on the Belgian market. And French payments services provider Ingenico Group finalised the merger of Ingenico Retail assets in the DACH region (Germany, Austria and Switzerland) with Germany payments firm BS PAYONE with the aim of becoming the leading payment provider in Germany. As internal regional consolidation in Europe heats up, the biggest players in the market are capturing the attention of US payments leaders, who are looking to build global market leadership by expanding into Europe and beyond. The multi-billion-dollar PayPal-iZettle deal last year delivered the US giant an in-store presence in 11 markets in Europe and Latin America. 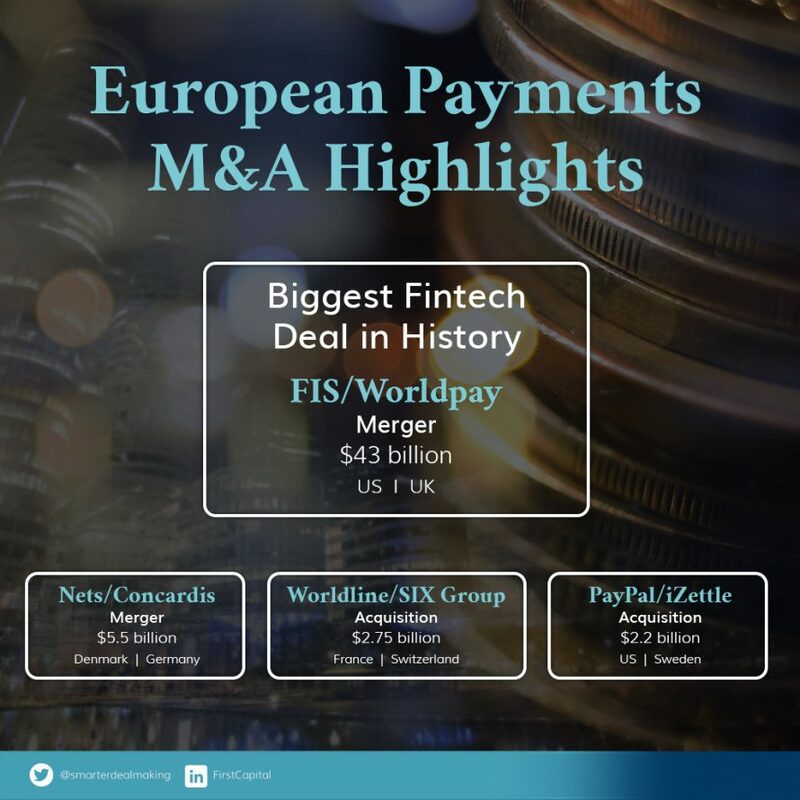 More recently, the giant FIS-Worldpay merger announced in March 2019 is the largest fintech deal ever recorded with an enterprise value of $43 billion. Together, the merged entity will take on the global digital payments market, combining their respective expertise in payments solutions for financial institutions and for merchants. Meanwhile on the funding side, the European payments market is also attracting increasing attention from international venture capital firms who are keen to tap into the opportunity. This means rising valuations for bigger players, such as TransferWise which in February was rumoured to valued at $4bn in a secondary sale, and promising possibilities of funding and potential transactions for up-and-coming payments fintechs. 2018 equally saw one of Europe’s biggest ever tech IPOs with Dutch payments unicorn Adyen successfully coming to the market. Adyen is now valued at over $15 billion – a higher value than the long-established Commerzbank AG. This market is going through a significant period of change and growth and is not likely to fully settle itself for a few more years. This trend of consolidation will very likely continue over 2019, as smaller players vie for control of the national market and larger players, including Europe’s fintech unicorns, strive to integrate enough solutions to be able to successfully deliver a full service offering to customers worldwide. What does this mean for European payments fintechs? Europe is a major player in the global payments market, with US buyers and investors beginning to capitalise on the growing opportunity in Europe, spurred on by pivotal activity such as Adyen’s IPO and the FIS-Worldpay merger. It’s an exciting time for European payments fintechs and we can expect further landmark deals from US and European buyers in the next few years to come.